Digital transformation, ICT technology and the digital economy are all buzz phrases flooding my Twitter stream. As a woman in tech, I’ve been involved in some exciting changes brought on by new technologies over the past few decades, but I don’t remember anything as impactful as what’s evolving now. Let’s back up for just a moment so I can give you some context. For the past 4 years, Huawei has invested in digital economy research. And each year, they release a GCI (Global Connectivity Index) specific for that year. The purpose of the GCI is to analyze a broad spectrum of indicators for ICT infrastructure and digital transformation to provide a comprehensive map of the global digital economy. The GCI is released by Huawei to assist policymakers who want to understand how to best capitalize on the digital economy for the benefit of their citizens. I’ve written about the GCI over the past 2 years. If you’d like, you can read my posts about the 2016 report and the 2017 report. Let’s fast forward. There are 5 new accelerators for digital investment. Those are 5G, Cloud, Big Data, IoT and AI. You can put a hashtag in front of any of those words on search.twitter.com to read a flurry of new blog posts every day. Huawei recently collaborated with Oxford Economics to develop a new approach to measuring the impact of digital transformation on economic performance. Huawei and Oxford Economics compiled this information into what is now called the Digital Spillover. We all know that digital transformation is key to achieving a competitive advantage in business, but this goes far beyond that premise. Digital transformation is also important to enhance the efficiency of government and serve its citizens in a much better way. According to Huawei, in the next 10 years, digital transformation will shift its focus to the supply side. As customer demands increase, businesses and governments will need to embrace ICT technologies and intelligence. There are 3 pathways for digital spillover. These include the internal digital spillover on an individual business level, the horizontal digital spillover across similar businesses and of course the vertical digital spillover across different industries. The digital spillover is key to understanding how digital investments translate into economic performance. You can read more about these details by downloading the Digital Spillover. How can governments capitalize on digital spillovers? 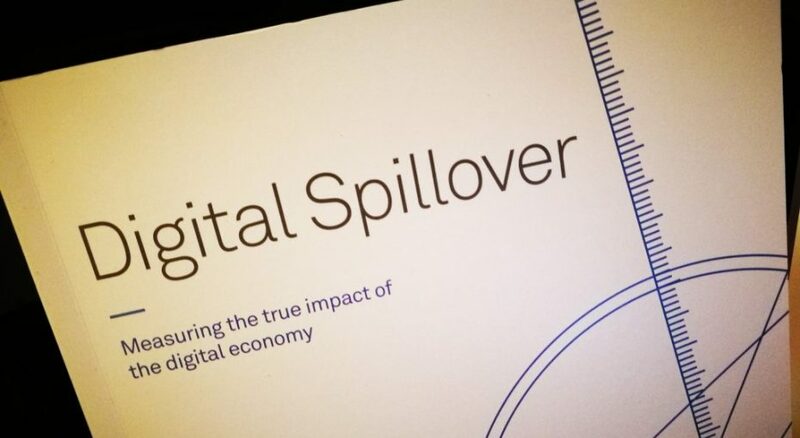 According to Oxford Economics and Huawei, there are 6 ways to maximize digital spillovers. Now we’ve come to my favorite part of this post which is looking ahead to what life will be like in the future. How will life change and what are the tangible effects of this digital transformation on the digital economy? Keep in mind, not every country will experience the same growth, far from it actually. I attended Huawei Connect in Shanghai recently, and it was fun to see Huawei paint a picture of what life would be like in 2025. We’ve already established that ICT technologies drive the continual progress of digitization. Our society is entering the intelligence era. All things are becoming intelligent, connected and sensing. Keep that in mind as you take this glimpse into 2025. In 2025, we’ll have smart robots. I’m looking forward to an AI Assistant. Google Assistant doesn’t count. I want a flesh and blood robot. Currently, there are billions of people who don’t have access to the Internet. In 2025, the complexion of connectivity will look much different. Also by 2025, Huawei predicts we’ll reduce carbon dioxide emissions per ICT connection by 80%. By 2025, 85% of enterprise applications will run in the Cloud. Those of us in the business are already seeing a massive shift in this direction. And, to nobody’s surprise, by 2025, we’ll be consuming an insane amount of data. 90% of it will be in the form of video. And last but not least, Huawei predicts there will be 100 billion connections by 2025. This makes sense since by then, 77% of the world’s population will most likely be connected. Many of us will own multiple (around 5) smart devices; hence 40 billion smart devices. Based on Huawei’s predictions, I’m really looking forward to 2025. But in reality, we all know that the future is somewhat unpredictable. Huawei has developed 4 scenarios to illustrate the routes the global economy might take. These are illustrated in the 4 quadrants in the image below. You can read about the variables by which these scenarios are defined at Global Spillover. I hope you’ve found this information to be as intriguing as I have. Each time I write about GCI or now… the digital spillover, I get excited about the evolution of technology and how it will ultimately define the quality of our lives. Please click over and download the Digital Spillover for yourself. Take some time to digest all the information presented. I think you’ll find that learning more about the digital economy is a journey worth exploring. To continue the conversation, please leave a comment below or tweet me at @adamsconsulting. Thank you for reading my blog post! Diana is a USC graduate, tech entrepreneur and member of the Apple Consultants Network. She has written 4,100+ blog posts around the blogosphere. She loves innovation, Star Wars and Java Chips. Connect with her on Twitter at @adamsconsulting or email her at adamsconsulting3@gmail.com.